A recent market study published by PMR - “Renal Anemia Treatment Market: Global Industry Analysis 2013–2017 and Forecast 2018–2026” does a comprehensive assessment of the most important market dynamics. On conducting a thorough research on the historic as well as current growth parameters in the Renal Anemia Treatment market, growth prospects for the market have been obtained with maximum precision. The report features unique and salient factors that may make a huge impact on the development of the Renal Anemia Treatment market during the forecast period. The report will help market players to modify their manufacturing and marketing strategies to envisage maximum growth in the Renal Anemia Treatment market in the upcoming years. The report provides detailed information about the current and future growth prospects for the Renal Anemia Treatment market in a most comprehensive way to facilitate better understanding of readers. 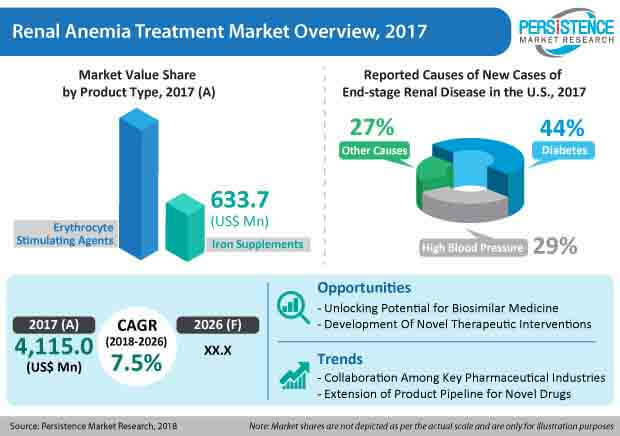 The report commences with the executive summary of the Renal Anemia Treatment market, which includes the summary of key findings and key statistics of the market. It also includes the market value (US$ million) estimates of the leading segments of the Renal Anemia Treatment market. Readers can find detailed taxonomy and the definition of the Renal Anemia Treatment market in this chapter. This chapter will help readers to understand the basic information about the Renal Anemia Treatment market. This chapter also highlights the inclusions and exclusions which will help the readers to understand the scope of the report. This section highlights the expenditure on health for top countries in each region. This section also explains the global and regional healthcare market outlook. The chapter analyzes deeply the political, economic and business environment outlook for the various regions covered under the scope of the report. This chapter explains the key macro-economic factors influencing the growth of the Renal Anemia Treatment market. Along with macroeconomic factors, this section also highlights the opportunity analysis for Renal Anemia Treatment market. This chapter highlights the key market dynamics including the drivers, restraints and trends impacting the growth of Renal Anemia Treatment market. In this chapter, readers can find information about the various factors propelling the growth of the Renal Anemia Treatment market and the factors which may deter the growth of the market. This chapter will help readers understand market opportunities and thus, strategize accordingly. This chapter highlights the key regulations for drug approval in the U.S. and Europe. This chapter also provides deep dive analysis on the products in pipeline in the Renal Anemia Treatment market. This chapter will help readers get an idea about the number of products in pipeline. This chapter includes detailed analysis of the growth of the North America Renal Anemia Treatment market along with the country-wise assessment for the U.S. and Canada. Readers can also find information about regional trends, regulations and market growth based on product type, route of administration, end users and countries in the Renal Anemia Treatment market of North America. Readers can find detailed information about regional trends impacting the growth of the Latin America Renal Anemia Treatment market. This chapter also discusses growth prospects for the Renal Anemia Treatment market in leading Latin American countries, such as Mexico, Argentina, Brazil and rest of Latin America. Important growth prospects for the Renal Anemia Treatment market, based on product type, application, technique, age group and end users in several countries, such as U.K., Germany, Spain, Italy, France, Russia, Poland and Rest of Europe, have been included in this chapter. Japan, India, Australia and Australia and rest of APEC are the leading countries in the APEC region and are the prime subject of assessment in this chapter on APEC Renal Anemia Treatment market. Readers can find thorough information about the growth parameters in the APEC Renal Anemia Treatment market during the period 2018-2026. This chapter provides information on how the Renal Anemia Treatment market will grow in the China Market during the period 2018-2026. This section will help readers get an understanding of the key factors responsible for the growth of Renal Anemia Treatment market in Europe. This chapter provides information on how the Renal Anemia Treatment market will grow in the major countries in MEA region, such as GCC Countries, South Africa and rest of MEA, during the period 2018-2026. This chapter highlights the key factors that were taken into consideration while forecasting market values for the global Renal Anemia Treatment market. The impact of the forecast factors in different regions has also been mentioned in this chapter. This section will help readers understand the assumptions taken into account while estimating and forecasting the market size of Renal Anemia Treatment market. In this chapter, readers can find a comprehensive list of all the leading stakeholders in the Renal Anemia Treatment market, along with detailed information about each company, including company overview, revenue shares, strategic overview, and recent company developments. Market players featured in thIS report include Amgen Inc., F. Hoffmann-La Roche Ltd, Pfizer Inc., Sandoz International GmbH (Novartis AG), Janssen Pharmaceuticals, Inc. (Johnson & Johnson), Teva Pharmaceutical Industries Ltd., AMAG Pharmaceuticals, Rockwell Medical, Akebia Therapeutics, Vifor Pharma Management Ltd. among others. This chapter explains how the Renal Anemia Treatment market will grow across various geographic regions, such as North America, Latin America, Europe, Asia Pacific Excluding China, China and Middle East & Africa (MEA). Based on product type, the Renal Anemia Treatment market is segmented into Iron Supplements and Erythrocyte Stimulating Agents. Further, the Erythrocyte Stimulating Agents segment is segmented into Epoetin Alfa, Epoetin Beta and Darbepoetin Alfa. In this chapter, readers can find information about key trends and developments in the Renal Anemia Treatment market and market attractive analysis based on product type for each region. Based on the Route of Administration, the Renal Anemia Treatment market is segmented into Oral and Parenteral. In this chapter, readers can find information about key trends and developments in the Renal Anemia Treatment market and market attractive analysis based on the route of administration for each region. Based on the distribution channel, the Renal Anemia Treatment market is segmented into hospitals pharmacy, retail pharmacy and mail order pharmacy. In this chapter, readers can find information about key trends and developments in the Renal Anemia Treatment market and market attractive analysis based on end users for each region. This chapter will help readers get an understanding of the research methodology followed to obtain various conclusions, important qualitative information and quantitative information about the Renal Anemia Treatment market. Multinational pharmaceutical companies that develop drugs for renal anemia treatment will play an important role in improving access to quality care in the developing countries. Pharmaceutical companies in the field of renal anemia treatment have reported strong financial results in the past few years. For instance, Novartis’ Binocrit used for renal anemia treatment has recorded significant growth in revenue in the last few years. The company expects that the revenue from the product will increase further in the coming years. Increasing number of pharmaceutical companies and increasing research and development with the aim of developing novel drugs for renal anemia treatment will contribute towards the growth of the concerned market during the forecast period. Biologics will play a significant role in the renal anemia treatment care market across the globe. The emergence of biologics and growing demand for biosimilar medicines across the world will create new opportunities for the players operating in the renal anemia treatment market. Biosimilar drugs are a cost-effective method of renal anemia treatment. They also allow for greater patient access, which will further push the growth of the renal anemia treatment market during the forecast period. FDA approval for various biosimilars for renal anemia treatment in the past few years will lead to huge benefits for patients suffering from renal anemia. For instance, in 2018, FDA approved epoetin alfa-epbx (Retacrit) manufactured by Hospira, Inc, as a biosimilar to epoetin alfa (Epogen/Procrit) for the treatment of renal anemia caused by chronic kidney diseases. Despite the many advancements in biomedical research and healthcare systems, the global healthcare burden is increasing globally. In order to meet healthcare challenges and develop novel drugs for renal anemia treatment, various pharmaceutical industries have developed a new business model to increase profitability and decrease cost of failure. New collaborative models within the pharmaceutical industry will further help to reshape the research and development of drugs for renal anemia treatment. Over the years, the strategy of mergers, acquisitions and collaborations within the pharmaceutical industry has continued to grow and has paved way for the development of drugs for renal anemia treatment. Open collaborations and new business models, such as joint ventures between pharmaceutical companies and other external entities, will push pharmaceutical research by facilitating partnerships involving academia and the public and private sector. Renal anemia occurs when the body has fewer red blood cells than normal. In case of anemia, red blood cells carry less oxygen than required to tissues and organs, especially to heart and brain. Anemia is a frequent complication caused in patients suffering from chronic kidney disease and occurs in more than 90% of patients receiving renal replacement therapy. Anemia of chronic kidney disease is caused by a decrease in erythropoietin production and anemia tends to get worse as the chronic kidney disease progresses. PMR conducted a research study on renal anemia treatment market for the forecast period 2018 to 2026. The renal anemia treatment market report offers a comprehensive evaluation of the business opportunities prevailing in the renal anemia treatment market along with insights on prevalence of renal anemia in top countries. The global report on renal anemia treatment also explains the key regulations for drug approval and pipeline assessment. The report on renal anemia treatment also elaborates on the macroeconomic factors influencing the dynamics of renal anemia treatment market and its futuristic potential. The report offers a comprehensive taxonomy of renal anemia treatment market based on product type, route of administration, distribution channel and end user and region. Product types covered under the current research scope of report include iron supplements and erythrocyte stimulating agents. The erythrocyte stimulating agents segment is further segmented into epoetin alfa, epoetin beta and darbepoetin alfa. By route of administration, the renal anemia treatment market is classified into oral and parenteral. The global renal anemia treatment market report has been segmented by distribution channels into hospitals pharmacies, retail pharmacies and mail order pharmacies. The renal anemia treatment market has been analyzed across regions of North America, Latin America, Europe, Asia-Pacific excluding China, China and Middle East and Africa. What are the major factors influencing the growth of renal anemia treatment market? What prescription pattern is followed by doctors dealing with renal anemia treatment cases? What is prevalence and treatment seeking rate of renal anemia in top countries? What are key regulations for drug approval and products in pipeline for the renal anemia treatment by geography? To estimate the market size of renal anemia treatment market, we followed an epidemiology based approach. Following are some of the steps we followed to calculate base year market size of renal anemia treatment market. Initially, we studied the prevalence of diseases in top 20 countries to analyze the potential patient population seeking renal anemia treatment. The prevalence of renal anemia among adult population in different countries was analyzed through in-depth secondary research. Culmination of secondary and primary research helped in zeroing on treatment seeking rates for renal anemia among the potential patient population in different countries. The process for this included primary interviews with nephrologists and nurses across leading hospitals in each of these 20 countries. The annual cost for renal anemia treatment was also validated through primary research.